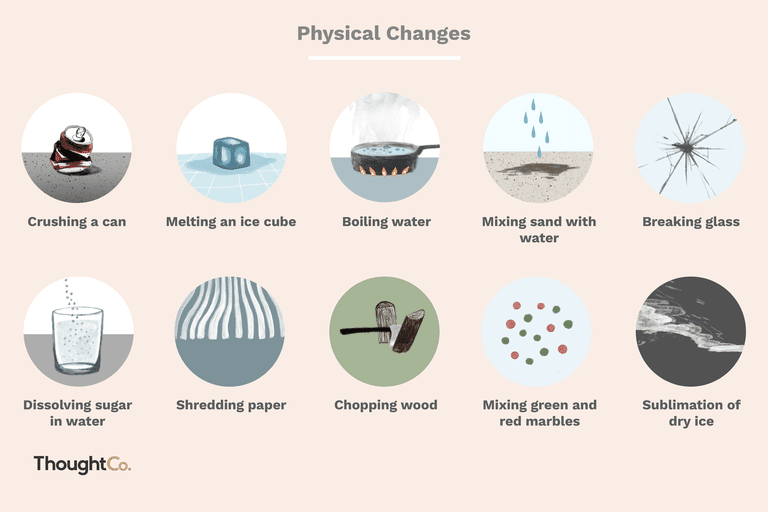 Physical changes involve states of matter and energy. No new substance is created during a physical change, although the matter takes a different form. The size, shape, and color of matter may change. Physical changes occur when substances are mixed but don't chemically react. Is the change reversible? Not all physical changes are easy to reverse. Was there a color change (with exceptions), bubble formation, or formation of a precipitate? These are all signs of a chemical change, not a physical change. Is the chemical identity of the end product the same as it was before the change? If the answer is yes, it's a physical change. If the answer is no, it's a chemical change. Melting solid sulfur into liquid sulfur. This is an interesting example since the state change does cause a color change, even though the chemical composition is the same before and after the change. Several nonmetals, such as oxygen and radon, change color as they change phase. Sometimes the easiest way to identify a physical change is to rule out the possibility of a chemical change. There may be several indications that a chemical reaction has occurred. Note: It's possible for a substance to change color or temperature during a physical change. Formation of a new chemical species. This is the best and surest indicator. A change in the chemical properties of the sample may indicate a chemical change (e.g., flammability, oxidation state).